The turtle was named Yawkey, after the remote beach in Yawkey-South Island Reserve where it was found. Rolling the leatherback up a ramp into the aquarium hospital. 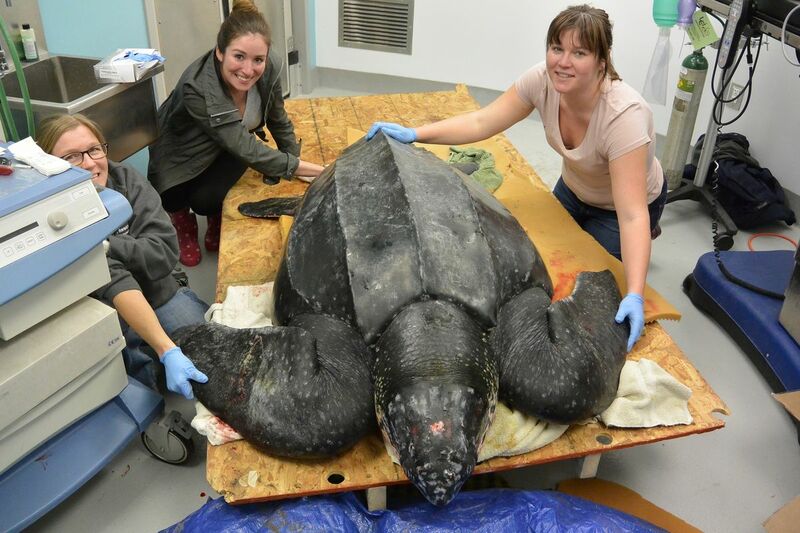 Biologists checked the leatherback for injuries. The turtle is thought to be between 10 to 15 years old. Leatherback turtles are the largest of all turtles and can weigh as much as 2,000 pounds (907 kilograms). Yawkey the turtle received antibiotics to combat any infections. After the checkup, Yawkey recovered in a small pool. As of March 10, Yawkey was improving and regaining energy. On March 12, aquarium staff prepped Yawkey for release into the wild. The rare turtle was released on the Isle of Palms, South Carolina. Yawkey was acclimated to the cool ocean temperatures offshore before the turtle's release.